The Conte Center at Harvard University is dedicated to basic neuroscience research that probes the developmental origins of mental illness. Funded by the National Institute of Mental Health, scientists in the Conte Center are pioneers in the diverse fields of brain plasticity, connectomics, genomic imprinting and super-resolution imaging, collaborating with experts in bioinformatics to establish a paradigm for unraveling the alterations in neural circuits that underlie disorders such as autism, schizophrenia, anxiety and depression. Faculty in the Conte Center have appointments across the University, including the Departments of Molecular and Cellular Biology, Chemistry and Chemical Biology, Physics, and the Center for Brain Science. With experiments spanning the level of individual molecules to complex behaviors, Conte laboratories aim to map the functional, genetic, and morphological changes underlying features of mental illness in mouse models. Currently the spotlight is on one type of brain cell thought to be particularly vulnerable to genetic and environmental insults associated with cognitive disorders: the parvalbumin-positive inhibitory interneuron, or "PV cell." PV cells orchestrate critical or sensitive periods—those windows of time when the brain is most readily shaped by its experiences, believed to be dysregulated in many neurodevelopmental disorders. 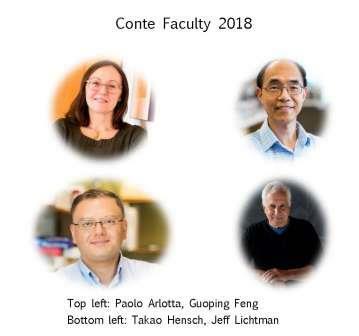 The basic research mission of the Conte Center is complemented by its deep commitment to education and outreach, supported in part by a collaboration with the Center on the Developing Child at Harvard. In addition to striving to build a unified science of health, learning and behavior, the Center on the Developing Child is devoted to the translation and application of knowledge that improves outcomes for children worldwide. The Conte Center is named after Silvio O. Conte, a Massachusetts Congressman who served 17 consecutive terms and was a champion for the funding of biomedical research, especially research on neurological disorders. Congressman Conte sponsored the resolution declaring the 1990s "The Decade of the Brain."